Q. Do you plan to offer a 3 element hex beam? A. No. And here is why. To start with, a 3 element hex does indeed have slightly better performance than a 2 element hexbeam which is the configuration sold by all hex beam companies and built by “do it yourselfers.” Gain of a 3 element hex would be better by a dB and a fraction, and front/back performance would be better too. But we feel that the negative aspects of a 3 element hex make it a questionable idea. First, the turn radius will be at more than half again as much as a 2 element beam and the weight will be more as well. The complexity of building the beam is greater and potential interaction among the bands will be greater. And the potential for storm damage is higher is well. These “negatives” outweigh in our minds the simplicity, durability, and confirmed performance of the 2 element hex beam. So, at least for now, we don’t plan to offer a 3 element hex beam. We believe the outstanding reputation of the conventional hex beam does not deserve the risk that would go along with the added size and complexity of 3 elements. Q. Is it better to place my order by telephone or online? A. It is much better to use the web site. It is more secure; your credit card information is better protected. It is faster, more accurate and easier. However, we realize that some have questions to be answered or feel more secure not using the web site and we are happy to talk to you and take orders by telephone. Q. How large is the hexagonal beam? A. The hexagonal beam has a diameter of 22 feet and is 39 inches high from bottom of base plate to top of the center post. Q. How large is the shipping carton? A. The beam is shipped in two cartons; a long box which is 48 X 6 X 6 inches and weighs 18 pounds and a flat box which is 12 X 12 X 6 inches and weighs about 11 pounds. Q. How high does the hexagonal beam need to be? A. Generally, higher is better for DX. However, many owners have used their beams as low as 15 feet successfully. Thirty or forty feet seems to be typical for most owners. Q. Is the beam directional? Do I need a rotator? A. Yes, the beam is quite directional even though it looks like a hexagon from above. It is a Yagi beam with bent wire elements and is about as directional as a conventional two element Yagi beam. So you do need to rotate it to gain the benefits of directionality. Q. Does the six meter add band work on 2 meters? A. The add band kit does operate with good SWR on 2 meters and will allow you to access your local repeaters and function in good propagation conditions to a limited extent. It has gain and minimal front back performance on 2 meters. Q. Does a metal roof cause problems with the hexagonal beam? A. Generally, no. Many hexagonal beam owners operate their beams atop a metal roof with no adverse effects. Q. Will other antennas in my yard interact with my hexagonal beam? A. Not usually. See our article on this hex interaction under Hex Ed. Q. How do I couple the hexagonal beam to my mast? A. See some photos here. Q. Do I need a balun? A. All balanced antennas fed with an unbalanced feed line like coax, need to have a balun. See more on this here. Q. 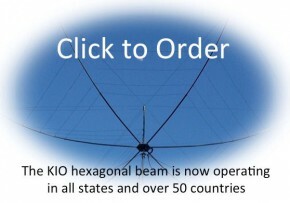 Can the KIO hexagonal beam be used as a portable antenna? A. Yes. The spreader arms come apart readily and are easily re-assembled. Dismantling the beam and re-assembly probably takes about an hour for one who is experienced with it. The dismantled beam will fit into a golf travel case that is at least 48 inches long and one foot wide. Q. Why don’t you build a 40 meter hexagonal beam? A. A forty meter hexagonal beam would be twice the size of a 20 meter beam and the structural requirements would be much different. As a result the price would be much higher and it is felt that despite the numerous inquiries, very few people would be willing to pay for a 40 meter beam. Q. Does the six meter band cause interaction with 17 meters? A. Six meters does not interfere with 17 meters at all. The 17 meter band does cause some interaction only at the upper end of 6 meters because 54mHz is the third harmonic of 18mHz. A high percentage of KIO customers opt to buy the 6 meter band with their beams and there have been no complaints of unsatisfactory performance due to interaction. 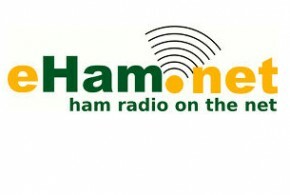 Another reason for the absence of concern is that most hams operate at the very low end of the six meter band where there is no effect from 17 meters at all. Q. Does the 12 meter band degrade 10 meters and other bands? A. Only slightly. Most people feel the minor degradation is worth the convenience of having both bands available. Q. Can I paint the beam to blend into the background and be more stealthy? A. Some do this and there is no problem at all in doing so provided you do not paint the wires as this could cause some de-tuning. See our article on painting the hex here. Q. In wet weather, my SWR seems higher than normal. Why is this? A. In wet weather, a thin film of water more or less, is on the elements of antennas and de-tunes the antennas slightly. You can learn more about this from our article here. Q. With my tuner I can get the SWR down low enough to operate on 40 meters using my hex beam. Is there a problem with this? A. There definitely is a problem with operating your hexagonal beam on any band other than those for which it is designed. Modern tuners are able to make the antenna system look like a good match for your transceiver even on a band that the hexagonal beam is not designed for. But any performance on an “off band” is very poor and it is likely that you are hearing stations on your coax feedline and not the antenna itself. And transmitting on “off bands” causes very high RF voltages on the terminals of the hexagonal beam which could cause damage to the beam and void your warranty. Q. Can I mount a UHF antenna on the top of my hexagonal beam? A. It’s not a good idea. There is no significant RF interference issue with mounting a UHF antenna above a hex. But the main problem is that the center post is insulated from the baseplate by a non metallic stub made of pvc. The center post is not designed for additional wind load that is presented by a VHF antenna mounted on the center post. It might work in windless conditions but in any significant wind, the center post would be subject to additional lateral force that could cause the center post to break at the pvc stub at the bottom where it is inserted into the base plate. For this reason, it is better to mount a VHF antenna on the mast below the hex.